Abstract: Objective To explore miR-362-3p expression in laryngeal cancer tissues and its effect on migration of Hep2 cells. Methods miR-362-3p expression in 50 pairs of tumor and adjacent normal tissues was detected by real-time PCR after sample collection. The relationships between miR-362-3p expression and clinical pathological characteristics in patients with laryngeal cancer were analyzed. miR-362-3p mimic, inhibitor, and control microRNA were transfected into Hep-2 cells. Transfection efficiency was determined by real-time PCR. Wound-healing and transwell assays were used to evaluate Hep-2 migration. Results miR-362-3p expression was significantly higher in cancer tissues than in adjacent normal tissues (P < 0.05). miR-362-3p expression was statistically significantly related to node metastasis and clinical stage. 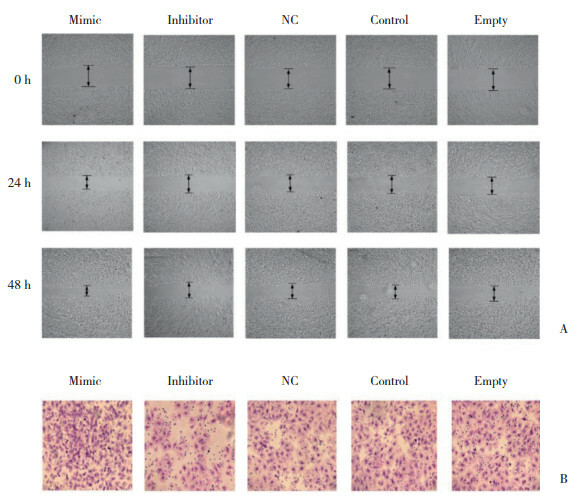 Transfection with miR-362-3p mimic and inhibitor significantly increased and decreased Hep-2 cell migration, respectively (both P < 0.05). Conclusion miR-362-3p is up-regulated in laryngeal cancer tissues and promotes laryngeal cancer cell migration, suggesting that it acts as a potential oncogene in laryngeal cancer. 1) P < 0.05 vs NC (control microRNA transfection) group. FU WN, Next generation sequencing facilitates quantitative analysis of transcriptomes at LncRNA and mRNA and miRNA levels between Hep2 cells with stable transfection of MYCT1 and non-transfection of MYCT1[DB/OL]. https://www.ncbi.nlm.nih.gov/geo/query/acc.cgi?acc=GSE123275.2018-12-04.